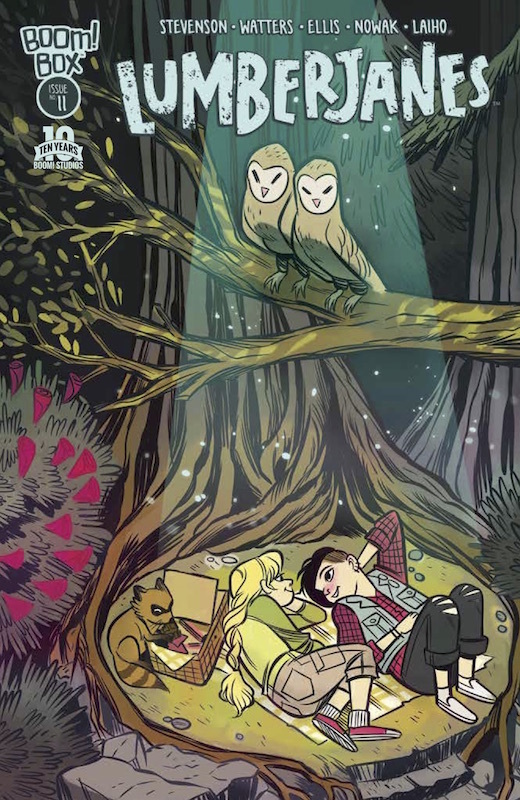 After the first Lumberjanes story arc ended, I was curious to see how the series would continue. The answer is, with more insight into the characters, particularly Mal and Molly, as well as hints about the camp’s history. The series continues to be written by Noelle Stevenson and Shannon Watters, but Carolyn Nowak is the new artist for this storyline. 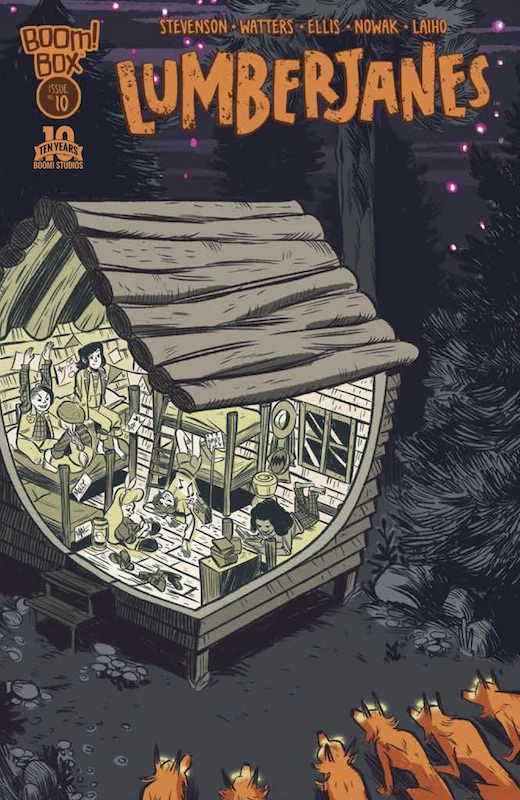 She does an incredible job staying true to the characters while capturing the weirdness of this particular camp and the adventures the girls encounter. We start with a free day at camp. Mal and Molly are going off on a picnic date, while Jo, April, and Ripley, bored, decide that they need to earn some scout badges. The list of options provides much of the humor this time around, from “Spick and Pans”, cleaning up cookware, to “Oldie but Goodie”, assisting the elderly. (Puns! Always puns!) The trio’s goofiness nicely counterpoints the more action-oriented segment, as Mal and Molly’s picnic doesn’t stay serene for long. The two see the Bear Woman in the woods, and they follow her, an impulsive choice made to get away from an unpleasant conversation. Although the girls have bonded, they come from different places and have left behind different experiences. Some don’t mind thinking about going home at the end of the summer; others prefer the life they have now. In issue #11, we find out where Mal, Molly, and the Bear Woman have wound up — a lost world populated by dinosaurs. Typical of the series’ unique blend of the outrageous and domestic, the old lady is looking for her glasses, which were taken by a baby dinosaur attracted to shiny things. First, though, there’s settling down for the night, which provides an opening for a heartfelt conversation, talking about how where one is affects the kind of person one is. Openings make opportunities, in other words. Meanwhile, the three left behind are trying cake decorating in an “Absence Makes the Heart Grow Fondant” workshop. It’s hilarious how they charge fast ahead, regardless of whether that approach is the right one for the event. It’s another example of how important context can be, but it’s also very funny, as they get carried away with competition. 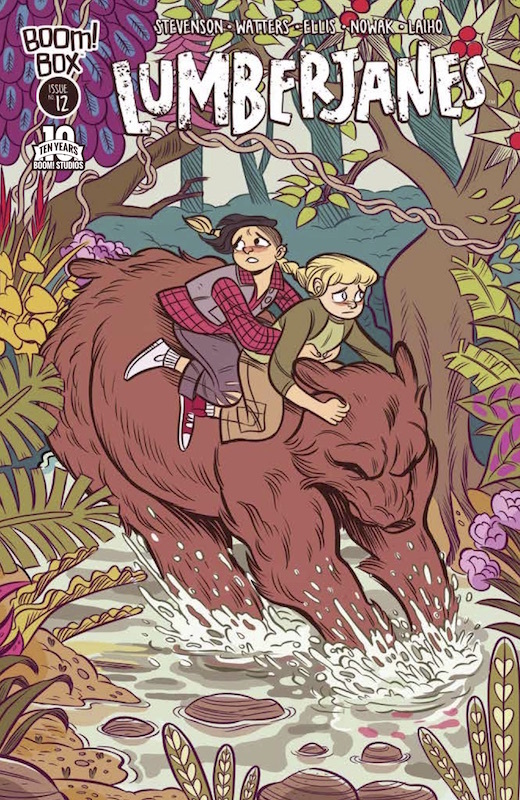 Lumberjanes #12, like the series overall, continues to blend over-the-top adventure with imagination, humor, and surprisingly deep feelings. Plus competitive scrapbooking. Although many of the plot threads are wrapped up here, there’s a “to be continued” at the end, so I’m curious to see what next issue’s denouement looks like. As always, friendship and teamwork together win the day.